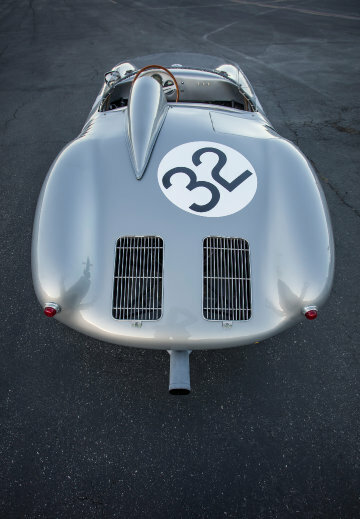 A Works 1958 Porsche 550A Spyder that finished second in class at Le Mans is an early lead car for the Bonhams Scottsdale 2018 classic car auction. 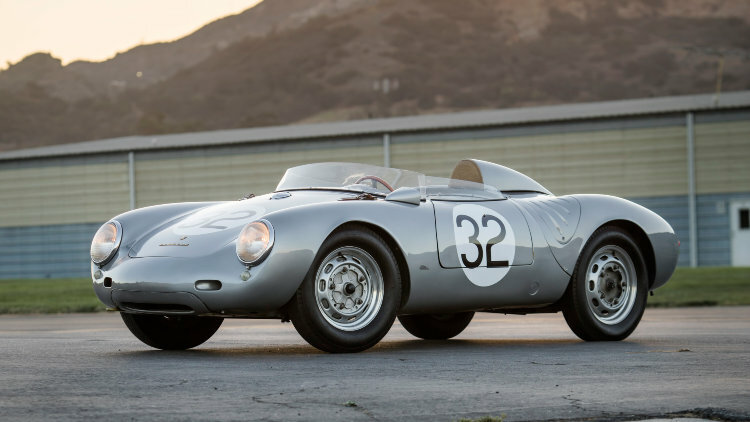 A 1955 Porsche 550A Spyder with exceptional provenance and successful Works entry competition history at amongst others Le Mans and the Nürburgring are the early lead entry for the Bonhams Scottsdale, Arizona, 2018 classic car auction. This 550A’s most memorable result was a 2nd in Class and 5th Overall at the 24 Hours of Le Mans but it was also Class Winner at the Nürburgring 1000 Km, the 12 Hours of Reims, the Zandvoort NAV Race, and at the Dutch Grand Prix. No estimate has been released yet but a highest bid of $4.2 million was rejected for this Porsche in 2016. Bonhams seventh annual Scottsdale auction is scheduled for January 18, 2018, at the Westin Kierland Resort & Spa, in Phoenix, Arizona, USA. The annual Scottsdale, Arizona collector car auction week is the traditional start to the classic car auction year. 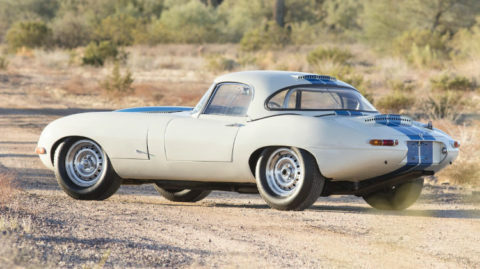 Bonhams’ Scottsdale 2017 top three results set model records for a Jaguar E-Type Lightweight Competition ($7,370,000), a Ferrari 340 America Competizione and a 1928 Mercedes Benz Typ S. Bonhams earned $36 million from just over 100 cars with sell-through rate of 82%. The early lead car for the 2018 Bonhams Scottsdale, Arizona, classic car auction is a 1958 Porsche 550A Spyder, chassis number 0145. This 550A Spyder was a successful works entry in four world championship races and even a Grand Prix race. The 1958 Porsche 550A Spyder, chassis number 0145, most noticeable results include a 2nd in Class and 5th Overall placement at the 24 Hours of Le Mans when driven by owner/driver Carel Godin de Beaufort. The car was also Class Winner at the Nürburgring 1000 Km, the 12 Hours of Reims, the Zandvoort NAV Race, and at the Dutch Grand Prix. 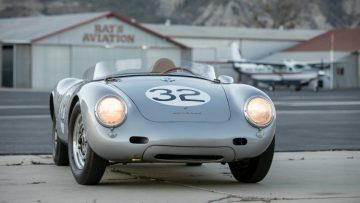 The Porsche 550 Spyder is one of the world’s most iconic sports-racing cars. This giant killer competed successfully against much bigger vehicles with larger engine capacities at races in especially Europe and the Americas. An automotive legend of design and performance, the instantly recognizable Porsche Spyder is in a class all its own. The first Spyder, the 550, is most associated in popular culture with James Dean who, like other race car drivers, admired it for its beauty, speed and nimbleness. The 1958 Porsche 550A, chassis number 0145, on offer at the Bonhams Scottsdale 2018 sale, stands out as a very special car among a very special breed. Boasting a pedigree that distinguishes it above all others, it was a Porsche Works entrant, a veteran of four world championship races, what is believed to be the only 550A to compete in a Grand Prix, and one of just 40 ever created. It’s competition history is not just pertinent but also illustrious with a 2nd in Class and 5th Overall placement at the 24 Hours of Le Mans, the Class Winner at the Nürburgring 1000 Km, the Class Winner at the 12 Hours of Reims, the Class Winner at the Zandvoort NAV Race, and the Class Winner at the Dutch Grand Prix, to mention just some of the outings. Furthermore, it’s one of the best original examples extant. This 1955 Porsche 550A Spyder has also participated in ten Mille Miglia historic races. With only around 130 Porsche 550 Spyders produced in all versions, these cars that were often raced hard are relatively rare and seldom come to auction. No estimate has been released yet for the 1958 Porsche 550A Spyder on offer at Bonhams Scottsdale 2018 sale. 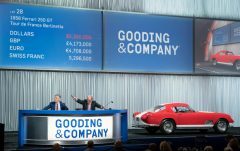 A highest bid of $4.2 million was not accepted for this car at the Gooding Pebble Beach 2016 sale when the estimate was $5-6 million. Only two of the earlier 550 Spyders were sold at auction in recent years. 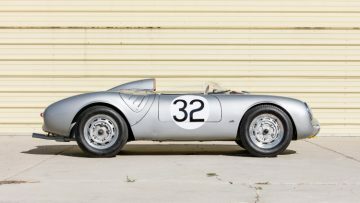 A 1955 Porsche 550 Spyder that raced in the US sold for $3,018,400 at the RM Sotheby’s Paris 2016 sale. 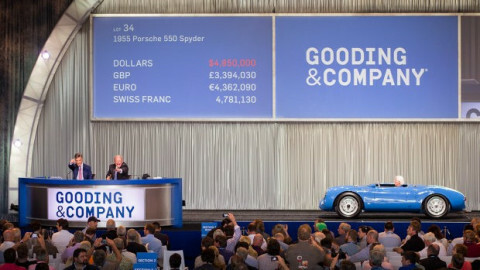 Jerry Seinfeld’s unrestored and exceptionally original 1955 Porsche 550 Spyder sold for $5,335,000 at the Gooding Amelia Island 2016 sale.